It is back to school season and we a celebrating with some unique desk lamp repairs. Today we have this nice gooseneck desk lamp made by Eagle. 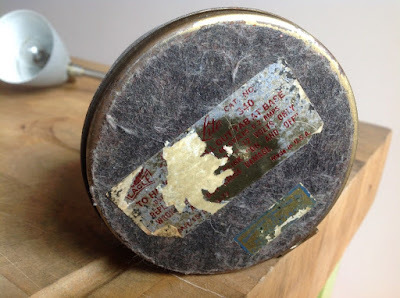 We don't have much information about this lamp except for what the label has to offer: Eagle Hi-lite Catalog number 340, pull tab, made in the USA. 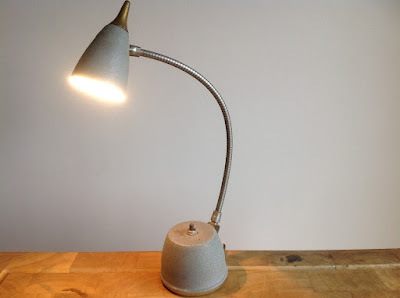 It is a nice small lamp with an industrial flair, textured gray finish and gold accents. This lamp is working but the old lamp cord is not polarized. Since this lamp works it is hard to call it an official repair. We will replace the lamp cord and make sure other components are in good working order. 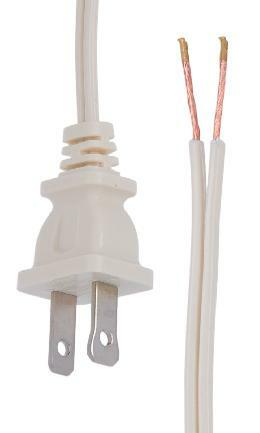 Here is the only lamp part we need to refresh this lamp: polarized ivory color lamp cord. Upon inspection, we find this lamp is not our traditional socket and bulb lamp. To keep it small this lamp has a transformer in the base to change the house current 120 volt AC to 12 volt DC. The lamp also has a different style bulb. This lamp takes a #93 12 volt bulb with bayonet style post. Luckily our bulb works. If we did not have a working bulb, the repair would be put on pause until we could get a working bulb. To replace the cord on this lamp we need to unscrew the nut from the push button switch. The base cover comes off the lamp. Here we can take a look at the transformer and make sure there are no signs of problems: dried or cracked wires, heat spots or places that look burned. The transformer looks good so we are still on track for the lamp repair. The cord connects to the transformer with a simple wire nut. We remove the wire nuts and snip the old cord just below the knot. The old wire has some clear sheaths for additional insulation. We will take them off the old wire and use them on our new lamp cord. 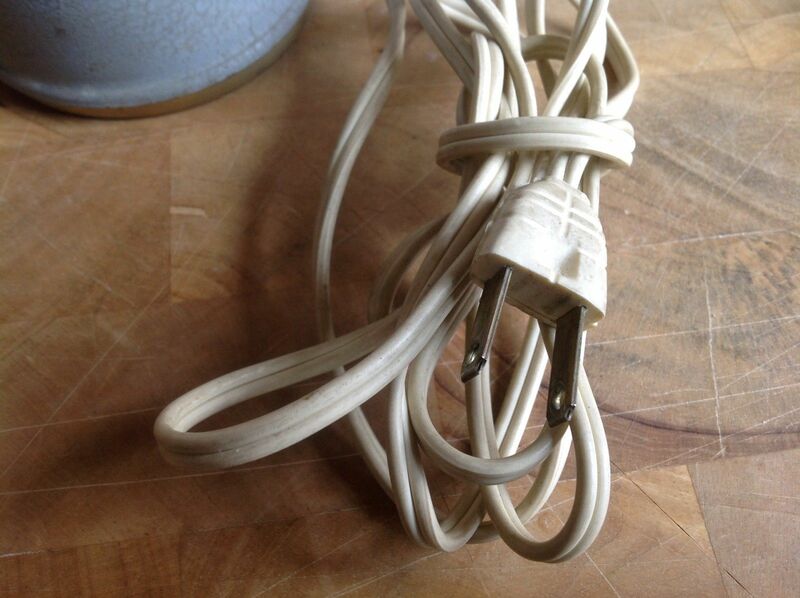 Using the old cord as a guide, we measure how long the wire needs to be and where the knot should be tied. We attach the new cord to the wires of the transformer. The smooth wire on our lamp cord attaches to the black wire on the transformer. The ribbed wire connects to the white wire. Since our old wire nuts are not brittle or worn out, we reuse them. With our lamp cord connected, we tuck them in the base of the lamp and close the lid. With the nut screwed tightly on the switch, we test the lamp. Perfect. Total cost < $8.00 Total time < 30 minutes.